« Yet Another Festival from René Martin. MUNICH — Philipp Stölzl’s new and relatively sane production of Andrea Chénier will be video-streamed Saturday by Bavarian State Opera as part of a regular free service. Omer Meir Wellber brings his inimitable visceral leadership to Giordano’s verismo score. 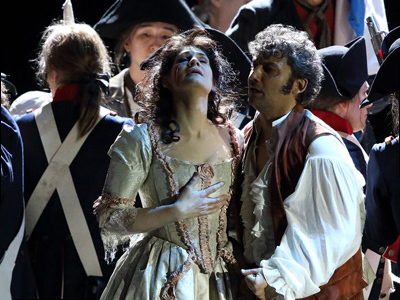 Anja Harteros and Luca Salsi make role debuts as Maddalena di Coigny and Carlo Gérard, while Jonas Kaufmann sings the conflicted poet. At yesterday’s premiere, Harteros’ Mediterranean temperament and absorbing, opulent tones recalled the work of Renata Tebaldi. This entry was posted on Monday, March 13th, 2017 at 5:46 am	and is filed under Munich Times. You can follow any responses to this entry through the RSS 2.0 feed. Both comments and pings are currently closed.